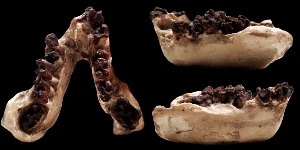 Oreopithecus: a human child’s jaw in coal? Home » Out-of-place artefacts » Anomalous human remains » Oreopithecus: a human child’s jaw in coal? The Oreopithecus jaw identified by Johannes Hürzeler as belonging to a human ancestor: even a non-expert can see it is not human! A jawbone, found at a depth of 183 m (600 feet) in a Tuscan coal mine, was identified by Dr Johannes Hürzeler of the Museum of Natural History in Basel (Switzerland) in 1958. It was badly distorted through its burial in the coal, but was sufficiently identifiable to enable it to be given an age at death of between five and seven. The coal itself was of Upper Miocene date, around 11,608,000 to 5,332,000 million years ago. A number of biologists suggested that it belonged to a human ancestor, Hürzeler going so far as to claim it as “the world’s oldest man”. This claim has not been accepted by the overwhelming majority of palaeoanthropologists. Since the initial discovery, more hominin fossils that are clearly related to Homo sapiens and are plainly part of our lineage have been discovered in Africa. 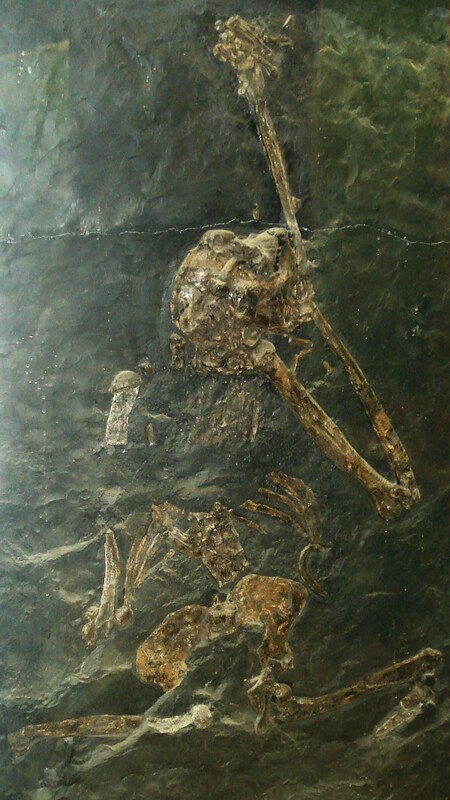 At the same time, other fossils of Oreopithecus have been found that show it to have been much more like an Old World monkey than a human. Oreopithecus is now largely ignored by anthropologists as a potential human ancestor. Was Oreopithecus human or related to humans? Creationists have taken Hürzeler’s claim to mean that he believed it to be fully human. For this to be true, it would need to show modern morphology. This is nonsense: it belongs to a fossil primate, Oreopithecus bamboli, which flourished during the Miocene period, around twenty million years ago. Some creationists have now reversed their position on the fossil, calling it “an aberrant ape or an aberrant relative of monkeys”. This is a typical creationist ploy: if a fossil is classified as a near-human ancestor, they make it fully human, whereas, if it is classified as unrelated, they make it fully ape or monkey. The shape of the jaw, which widens towards the read (usually described as being V-shaped) is quite unlike the mandibles of Homo sapiens, in which the sides are more-or-less parallel (usually described as being U-shaped). The teeth (and especially the molars) are quite unlike those of any human ancestor and suggest that Oreopithecus belonged to a different lineage. A visual comparison with other extinct ape species shows just how unlike humans it was. It is now generally classified as a monkey, not an ape. We have sufficient fossils to tell us a little about the was not bipedal, although the feet were adapted for standing upright. Instead, it seems to have spent most of its time swinging from branches. Its brain capacity has been estimated to be 276-529 cm3, which is much smaller than any human. The teeth have been thought by some to be adapted for eating food resources from marshland environments. It appears to have lived on an island, where it evolved its characteristic traits and was largely immune from predation. As a potential human ancestor, it fails. As an extinct ape, it is an interesting genus. 2 Responses to Oreopithecus: a human child’s jaw in coal? I’m not on anyone’s side here, but perhaps can contribute some helpful facts. No offense to anybody. First the cup, iron and coal (carbon) under the considerable heat of deep underground pressure, could possibly transform iron into some type of steel. This would require quite considerable time, but could harden it and improve it’s elasticity somewhat (like spring steel). Not definitely but possibly. Second, the so called oreopithecus bamboli jaw was an organic artifact. Organic in this situation meaning a living organism which is carbon based. A twenty million year old oreo is nonsense. At least without photo ID. Six or seven million years is more realistic. The bones of the body would have shown significant elasticity if it had been buried shortly after death, or fallen into a crevice which caused death. And available water would have helped. So the twisting and bending is not unusual. And sometimes more often the rule than the exception. Finally, If you look at the jaw, you will see that it widens toward what would be the back of the mouth. This is an indication of a position between what we were, and what we are. As our ancesters evolved, the foramen magnum, which is where the neck enters the back of the skull in the great apes, lower and more forward in our early progenitors, then through evolution, the top of the neck gradually shifted downward and to the front. Therefore the entry of the neck is now at the base of the skull. The rear of the jaw had to widen to allow the windpipe to fit into all this multimillion year remodeling. This accommodates humans walking on two legs to look ahead. Not the only change by any means. But we can also look back over our shoulders. They couldn’t. I hope this may help.